Have you ever made banana chips? I assure you that a homemade version of this fruit chip is (almost) always healthier than any commercial product you can buy. The procedure is surprising easy -just slice and bake. In fact, this two-step procedure is exactly how these Apple Chips and these Oven Dried Strawberry chips are made. What do I need to make Banana Chips? Bananas! No surprise here. You can use as many bananas as you like. Make sure they are ripe, but still firm. Lemon juice. This provides the perfect amount of zing! As far as accessories are concerned, you need a cutting board, a sharp knife, a pastry brush a cookie sheet and parchment paper. The hardest part about making these dried banana chips is waiting for them to come out of the oven. Go ahead, grab the sharpest knife you have and let me show you how ridiculously easy these are to make. Since we will be making baked banana chips, the whole process begins by preheating the oven. You will want to set it at 225°F. Next, you are going to line a cookie sheet with parchment paper. Once that’s done, squeeze a little bit, about a tablespoon, of lemon juice in a bowl and get a pastry brush ready. Peel and slice your banana into 1/16th – 1/8th inch thick slices. As a general rule, the thicker the slices the longer the banana slices need to stay in the oven in order for the moisture to evaporate. Lay them on the parchment lined baking sheet in a single layer and without touching each other. Lightly brush the top layer with lemon juice. That’s it! They are ready for the oven. After baking for two hours, they should be almost completely dry and turn a light brown color. Peel them from the parchment paper, flip and continue baking until they are completely dry, with no moisture. Once you remove them from the oven, they will become crisp. As you can see, there really is nothing complicated about making this banana chip recipe. Slice the bananas uniformly so that they bake evenly. Dried banana chips can be stored in an air tight container. Banana chips are a great addition to breakfast bowls, granola and yogurt. What kind of bananas make the best banana chips? Bananas that have speckled peels, but are still firm. Are banana chips healthy? Homemade banana chips provide a snack alternative and are so much healthier than any commercial product which contain high amounts of sugar and fat. Ever since I can remember, I have always loved foods that provide a good crunchy texture. Although never a fan of potato chips, I prefer the savory crispness of Italian Taralli. Similar in texture to bread-sticks, these savory treats definitely provide a great crunch. 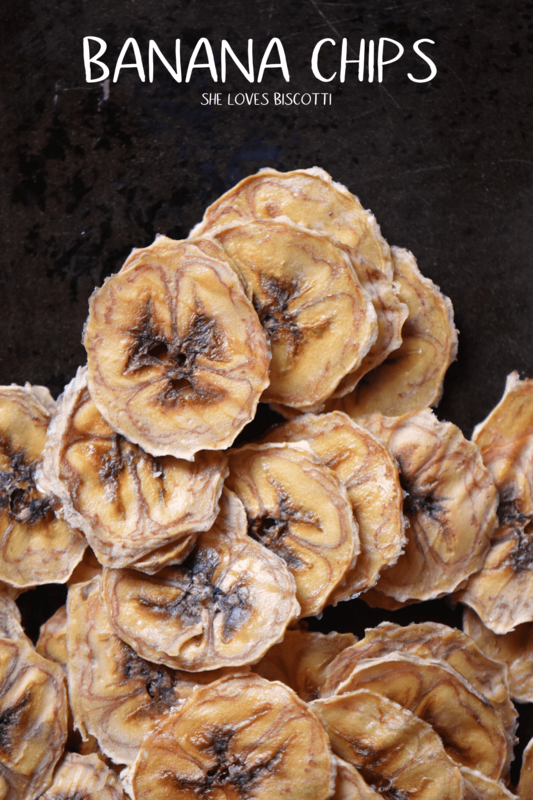 Dehydrated banana chips were another favorite food that provided a great crunch. Unfortunately, that was not the only thing it provided me with. When I was studying to become a dietitian, I became obsessed with reading food labels. A quick peak at the list of ingredients in any commercial product for banana chips convinced me that I did not need the added sweeteners nor the ridiculous amounts of saturated fats as a result of them being fried. I was recently at Costco, waiting in line, and scrolling Pinterest. I came across banana chips and thought to myself that’s a great idea. Homemade banana chips. A few days later, I am sharing this DIY with all of you. Use different spices such as cinnamon or perhaps a bolder spice like chili to give it a little flavor. Use it as a topping for your homemade breakfast bars. Do you have any other ideas? I would love to hear about them! ★★★★★ If you have made these banana chips, I would love to hear about it in the comments below and be sure to rate the recipe! Have you ever wondered how to make banana chips? Naturally sweet & crunchy -it's easier than you think and so much healthier than any commercial product. Peel and slice your banana into 1/16th – 1/8th inch thick slices. Place banana slices on the parchment lined baking sheet in a single layer and without touching each other. Lightly brush lemon juice over the top. Bake for approximately 2 hours and then turn each slice over. You may need to peel them off the parchment paper. Bake for an additional 15 minutes or until banana chips are moisture free. Remove from oven. Will get crispier as they cool off. IF YOU ENJOYED THIS BANANA CHIPS POST, SAVE IT FOR LATER. Never though I could make these at home ! Pinning ! It really is so easy to make these banana chips. The kids love the crunch and they are healthy! A win-win situation for everyone 🙂 Thanks for stopping by!